The desire to bring organization to your home is one we can empathize with, and one in which we are uniquely qualified to help. You may not think that you have enough available space in your home to add a closet, cabinets, pantries, etc., but we’re here to tell you that you do. We offer free consultations for all prospective clients because it represents an opportunity to show them how they can better use the space available to them, and how they can do so affordably. Our free consultations are available at your convenience, and do not constitute an obligation of any kind on your part. We’ll come out to your home or business and spend a little time with you in your own environment. By doing so, we can get the “lay of the land,” so to speak, and begin to point out ways in which your usable space is being underused, and how you can maximize it. 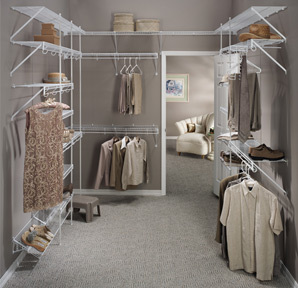 Many of our customers never dreamed they had the amount of available storage space in their home that they did. It is always our pleasure to point out that potential space to them. We can do the same for you during your free on-site consultation. We’ve been in business since 1977, and our experienced and knowledge designers have seen homes that seemingly didn’t have one iota of unused space. Such homes are stressful to live in, because on some level we all need our space. We’d love to show you how easy and affordable it can be to open up your home and make organization a centerpiece of your living conditions. Take a look at the Photos section on our website in order to get a feel for the type of work we can do. Then imagine the difference a custom-designed closet, entertainment center, garage, home office, laundry room or pantry could make in your home. Imagine a home in which everything has its place, and you literally have room to roam. It’s not far-fetched at all! Schedule your free consultation and begin making the most of your square footage!